The Marble Palace stands close to the Field of Mars. For the first years after the foundation of St Peters­burg, the Post Yard with a hostel had been standing on this palace. The palace was erected between 1768 and 1785. It was designed by the architect Antonio Rinaldi. 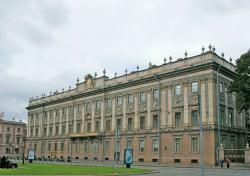 The palace was intended by Catherine II for her favourite Count Grigory Orlov, but he died before the construction ended. Later the palace became a residence of the last Polish King Stanislaw-August Poniatowsky. Then this building belonged to Konstantin Pavlovich Tsesarevich and after him became the property of Grand Duke Konstantin Nikolayevich. The last owner of the palace was Grand Duke Konstantin Romanov. He was a well-known poet, who signed his verses with his initials K. R.
The palace was given its name because marble of 32 sorts was used in its facade and interior decorations. The Marble Palace is one of the few buildings in St Petersburg where natural stones of different kinds are used instead of more common plaster. The style of this building is a transition from Baroque to Classicism. The facades of the palace are modest and laconic in design. The walls are faced with grey granite. The first and second floors are decorated with Corinthian pillars hewn from pale pink marble. The decor of the main facade overlooking the fore­court is largely executed in the Baroque style. On the eastern side of the court stands a building erected in the 1780s and rebuilt in the 1840s by Alexander Bryullov. The western facade of the court is decorated with a bas-relief frieze “The Service of Horse to Man”. The author of this frieze is the sculptor Pyotr Klodt. We can see his famous sculpture group “The Taming of Horse” on Anichkov Bridge. An elegant railing surrounds the forecourt. In front of the east side of the palace stands a monument to the Emperor Alexander III. Alexander III was the founder of the Russian Museum. This monument was created by the sculptor Paolo Trubetskoy in 1908. Now a branch of the Russian Museum is housed in the Marble Palace. Art exhibitions are often held in the palace.